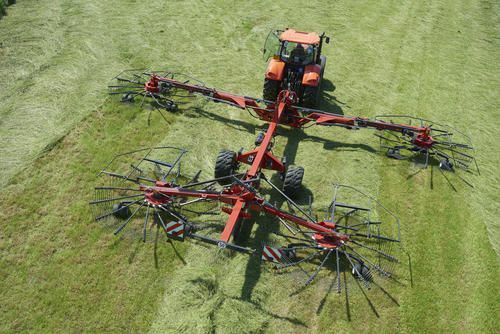 The new Andex 1505 is an exceptionally productive four rotor rake that is designed for heavy and intensive use. Packed with features it leaves no room for comprises and easily adapt to task and job site. Four rotors, maintenance-free gearbox, 15m working width and heavy duty mainframe design leave no doubt that this is a rake for the most demanding customer segment. The special elbow design of the front rotor arm is a true hallmark of the Andex 1505. 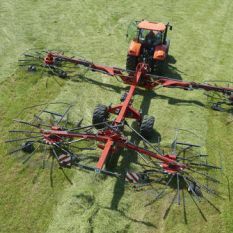 This unique Vicon design allows for an impressive working range between 9.80 and 15.00m, in fact unmatched flexiblity that only Vicon offers. Width Adjustment: Hydraulic adjustment of working width width between 9.80-15.00m. Height Adjustment: Hydraulic adjustment of rotor height. Manouverable: Active steering wheel axles for excellent manoeuvrability. Steering: Active steering wheel axles for excellent manoeuvrability. Compact: Clever folding mechanism, allowing the rake to go below 4.00m without removing tine arms.